We are remodeling our home and are building a bedroom for our 8yr. old daughter upstairs (11' by 15'). The room gets somewhat low natural light from a fairly big window on the north wall. The ceiling is flat, but then slants down on two sides and has a natural (somewhat lighter) pine (wood) on it. 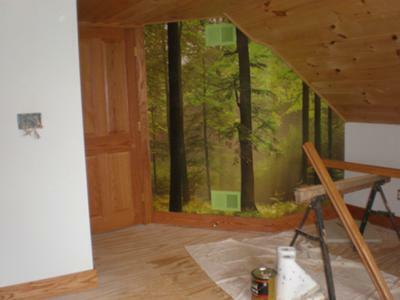 We put a forest wallpaper mural (all trees - lots of different greens) on one wall. Some of the greens in the mural are very bright green, which doesn't exactly show in the photo (a bit more yellowish in photo than what it actually looks like). 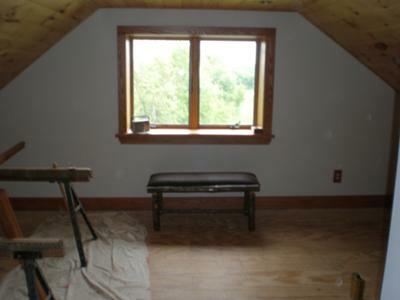 We are trying to decide on a color to paint the other walls. We are thinking green, only because green would be best with the mural ( I think?). I would like it to be something more "grown up", that will not need to be changed as she gets older, yet a color she will like. We are going for a "nature" or "forest" feel for her room. I've been told to go with a greyish green with the mural, but I don't think I like any greyish greens (nor would my daughter). I was told "Grass Cloth" or "Corn Husk Green" by Behr; I bought samples of each, but not sure if both maybe too blah? I don't want a really bright color or really dark color. Maybe a very pale outdoorsy green with a hint of grass green to it (not too bright or dull and not celery or mint - something that would look good with other greens in the room) and then bolder greens as accents such as pillows etc. I would appreciate it. Photos would help. We are looking at Behr, Valspar, Glidden, Pittsburgh paints and Sherwin-Williams. I am very confused, as I have gotten several suggestions and paint samples and am now more confused than ever. Looking forward to any suggestions. Thanks! If that doesn't seem right, back to the green: you have enough brown in the wood, so I would try to pick up an overall color that's in the mural. When you're trying to pick up a color that's in a print or wallpaper, always go for kind of an overall color, that seems to work the best. If you get too specific - or try to get too specific with an exact color in a pattern - you just go crazy and ends up looking off. It's hard for me to pick something out from the photo, especially since you mentioned it wasn't as gold as it looked in the photo. You need a rich color, I think, but not too bright. Rather than grayed, I'd just say a more natural green. Pittsburgh calls them "muted" greens. 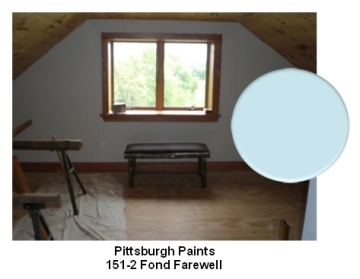 Look around these paint colors to see what's closer to blending with the mural. It's a great idea for your daughters room, I'm sure she'll enjoy it for years to come. If you have to put something on the window, you might want to try to find a long tree branch. Spray polyurethane it and set it up like a curtain rod and put something in plain white either draped or rings. She'll feel like a hobbit! My daughter's room is painted in Duck's Egg Blue color and it is really pretty. I wasn't sure about it when we started cutting in, but after we got it on all the walls, it was amazing!